03:04 pm :: Posting here until blogspot decides to cooperate. Posting here until blogspot decides to cooperate. Tuscany, by Cascade, in color 40320. I love this yarn and want to have its babies. 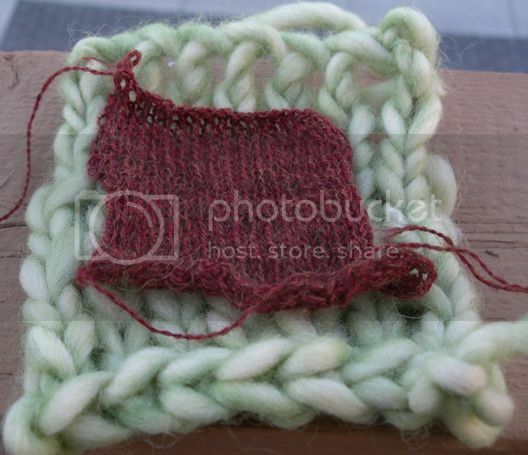 Or at least hope to be able to afford enough to make myself a nice thick afghan for cold winter nights. Not going to happen, though, not at $14.50 a ball. Gauge achieved using recommended needles: No - one size up to US 19 did get gauge, however. Swatch size: 4" wide x approximately 4" high and it was a near thing. 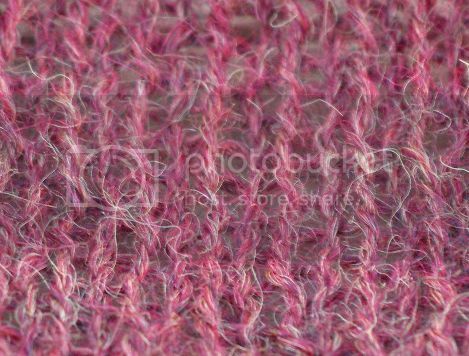 And, because it looked and felt so wonderful, I put off knitting it up until the very last of the four yarns. 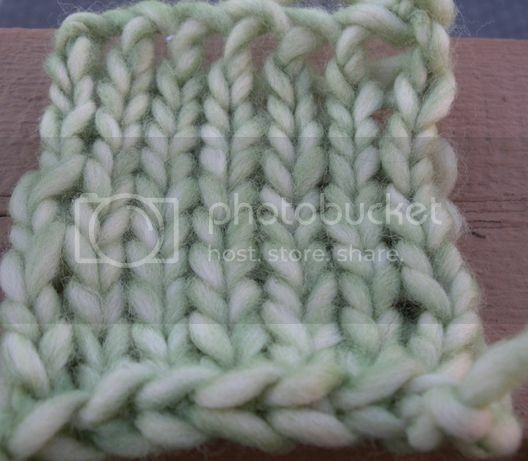 Naturally, not getting gauge on the first go-round meant that I had to frog what I'd knit. Frogging was no problem, though it had just a hint of a mohair-like fuzz. Seriously. Can't you see a huge old blanket, maybe with some cables but maybe not, made out of this? It was wonderful to work with, though it's been a while since I knocked anything out on US 17/19s, so working with the large needles was a bit of a nuisance. 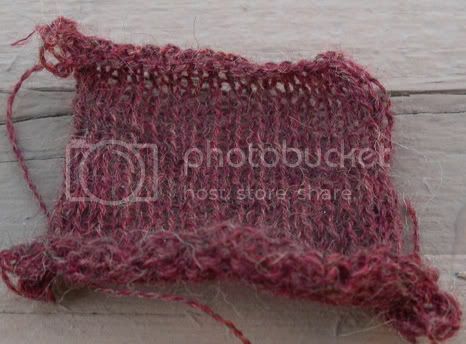 Close-up of stitch definition. Almost at true-to-lifesize, but a little larger. So, I'm thinking blanket, or maybe another set of bulky knit slippers from Socks Soar on Two Circular Needles. 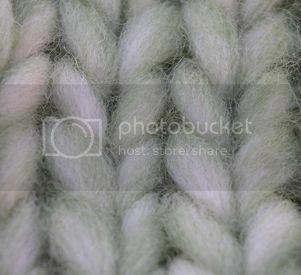 I don't see making a sweater out of this yarn, though; even for my sensibilities it's a bit too bulky for that. I bet it would make neat knitted toys, too. So, I have given up on the idea of knitting anything out of Alpaca Cloud in the round; I just can't muster up the coordination to do it (IOW, I kept dropping the needles out of the stitches and got too frustrated to continue - I knit for FUN, darnitall). I also realized that I needed a basic gauge swatch of the stuff, both to determine what a good fabric quality was going to be like and also to get used to working with something that fine. Sock Weight is the thinnest yarn I've previously worked with, and I think that after I finish up with this Alpaca Cloud it's going to be the thinnest I ever work with again. Unblocked, finished swatch on US size #4s. I think the 4s are too small, and the 8s I tried were too big, so I think I may settle on a size 6. This is ~8 rows and 6 st to the inch. Closeup of the fine stitches. I think I'm going to work a half-circle shawl out of it, rather than a square, but that means re-charting my patterns. Not to mention that Coyote is not cooperating with me at all; I can't find a lace pattern that satisfies all his criteria, and I'm not confident enough to try and make one up on my own. Oh, well. you are right-- it looks like roving!!!! Can you see a supersized version of the Big Bad Baby Blanket (from S&B, the original) in it? That's what I see. Enough of a pattern that it would add interest, but something that won't be too intrinsic (not sure how well it'll fuzz out once it's been washed a few times). Ooh, that would be cool, too! I was thinking more something like the first blanket I ever made, which had a diamond-and-cable pattern, but the BBBB would be really neat (and probably end up adult sized, to boot). I'm glad I'm not the only one who hates ribbing - in fact, I'm just generally not fond of making sox at all.